More than 1,200 delegates from 147 institutions in China, United States, France, Japan, Korea, Cameroon and Kingdom of Saudi Arabia, attended the 2018 China National Symposium on Combustion. The annual national symposium convened at Harbin Institute of Technology in Harbin, China from Thursday, 13 September to Sunday, 16 September, 2018. 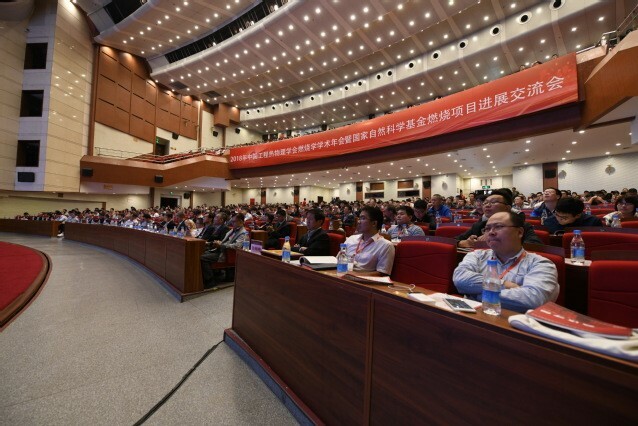 The China National Symposium on Combustion has been held annually for many years and has been the most important academic conference in combustion research in China. The symposium was organized by the Chinese Section of The Combustion Institute and the Natural Science Foundation of China (NSFC). The technical program consisted of contributed papers, Work-in-Progress Poster (WiPP) and popular science works sessions. Seven plenary lectures and twelve topical reviews were presented by eminent specialists on multiple topics of fundamental combustion research. Beginning from this year, popular science works relating to the combustion science and technology were called for exhibition. In total, 19 invited oral presentations, 263 normal oral presentations, 300 posters and 54 popular science works were presented during the symposium. The progress of 162 projects supported by NSFC was also reported by oral presentations or posters and a Young Scholars Forum was organized to share research experience. Since 2016, papers in English were accepted and in this symposium there were four sections with presentations in English for both foreign and domestic attendees. At the opening ceremony on 13 September, Prof. Qiang Yao from Tsinghua University and Prof. Minghou Xu from Huazhong University of Science and Technology announced that Prof. Jinyuan Xu from Xi’an Jiao Tong University received the Outstanding Contribution Award due to his contribution in boiler combustion research and his teaching in courses of combustion and fuel-burning equipment. Also, in his role as Secretary for Sectional Affairs, Prof. Fei Qi from Shanghai Jiao Tong University reported the progress made by the Chinese combustion community. For the first time, a workshop was organized to discuss recent progress and challenges in combustion used in industry. This workshop helped to bring close interactions between industry and the combustion community. Besides, Women in Combustion was organized for the first time to promote communication among female combustion researchers in China. The committee meeting of the Chinese Section of The Combustion Institute was also conducted during the symposium. Recent works by several sub-committees were discussed. Prof. Naian Liu from University of Science and Technology of China reported recent changes in the China National Symposium on Combustion. Program Co-Chair, Prof. Zheng Chen from Peking University presented the report from the program committee. At the closing ceremony and banquet on Sunday, 16 September, the chairman of the awards committee, Minghou Xu announced 10 Best Paper Awards, 10 Best Poster Awards and 15 Best Popular Science Works Awards in this symposium. After the award ceremony, Haiqiao Wei from Tianjin University reported the preliminary preparation and arrangement work for the 2019 China National Symposium on Combustion, which will be held in Tianjin, China.